This entry was posted in Contemplation, prayer, Epiphany, faith, Spiritual Practices, spirituality and tagged hope, light, love, Prayer, Wendell Berry. Bookmark the permalink. How can I see the wind as something that takes the light. The wind is a sacred companion like the blessed dark of contemplation. I hear it coming through the trees towards me alive with the Spirit of the Living God riding in it’s midst. It tests the trees, breaking all that will not bend, just as life tests me. It reminds me of the love of God as it cools me on a hot summer day. It reminds me of the power of God as it whips through the world…in, around, and through everything. The weak flame it may extinguish, but the strong flame it strengthens. It can fan the flame into a wildfire that will destroy the logs and underbrush that stand between me and the sun(Son). It is a controlled strengthener of the refiner’s fire to burn away the impurities of the silver of our souls until we shine with the reflected light of God. Without the wind and the oxygen it contains, our little flame would gutter and go out. We cannot carry a candle against the wind. We can, however, carry it with the wind. Ah yes, Mikal, the Rhuah, Pneuma- the wind of creation and dissolution, and spirit and life! You describe it so beautifully. Thanks for these important words. Here, I was responding to Berry’s poem and metaphor as the wind being those things within and around us which cause our lights to sputter and sometimes even to go out from time to time. I like his humble prayer for God’s strength against those things in ourselves and world, which are not from God’s Spirit and seek to put out the light in human souls. And sometimes what rattles and crashes and thumps in the darkness of our hearts is only the wind – “nothin to worry about” as my grandpa used to tell my mother as a child. 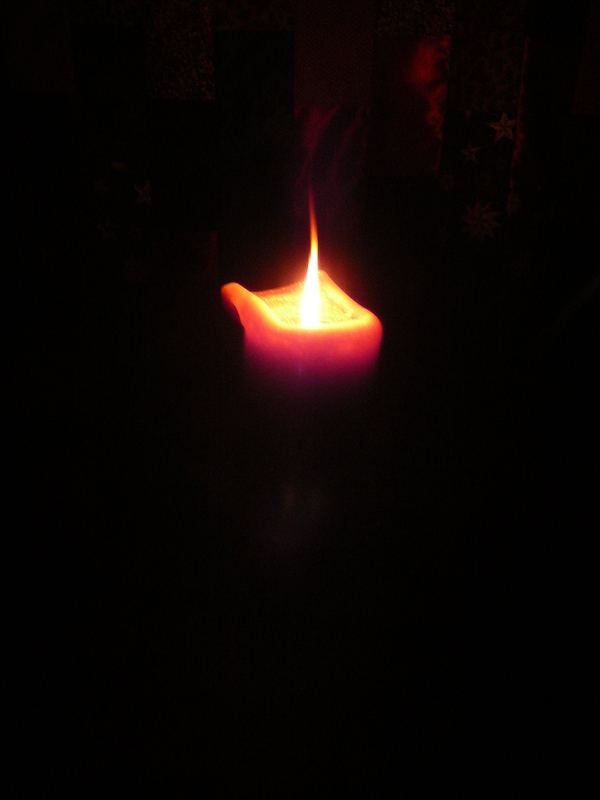 Blessings to you as you carry your candle with the wind. Hold it high for us all.